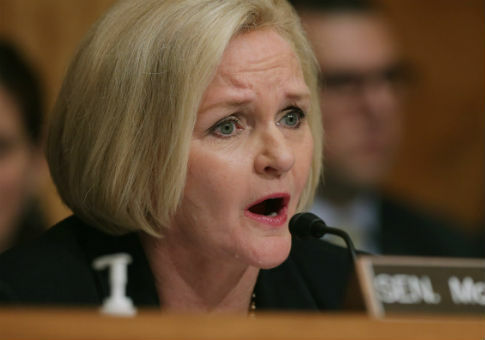 A watchdog group on Thursday filed a complaint with the Senate Ethics Committee, requesting that it open an investigation into Democratic Sen. Claire McCaskill (Mo.) for failing to disclose income earned from the private plane owned by her husband. The Foundation for Accountability and Civic Trust (FACT), the ethics advocacy organization that filed the complaint, cited McCaskill's 2017 Senate financial disclosure, which reported between $0 and $200 of income from leasing the private plane for outside use. However, FACT pointed to data gathered from independent flight tracking websites that show the plane "traveled more than 40,000 miles and logged over 150 hours of flying time on more than 150 flight segments" in 2017. FACT determined that the hourly charter rate for McCaskill's plane is $1,600 per hour and that, at this rate, "if every trip the plane made in 2017 was a charter trip, the plane would have generated nearly $250,000 in income" last year. "A single charter flight at a rate of $1,600 per hour would likely generate more than $200 in income for the aircraft owner," FACT's executive director, Kendra Arnold, wrote in the complaint. McCaskill uses the plane—which is is owned by TLG Aviation, LLC, a company owned by her husband—for campaign travel and leases it for outside use. Arnold also noted that any senator who intentionally falsifies information in their Public Financial Disclosure or other statements to the government may face criminal prosecution and a fine of up to $50,000. All senators are required to disclose their income and the source of that income in their financial disclosures, and they must report income of over $200 if it is "earned or accrued by an asset owned by either the senator or their spouse," according to the complaint. McCaskill said in her 2017 disclosure that TLG Aviation, LLC was worth over $1 million and that the plane is valued at over $3 million. Arnold blasted McCaskill for being "ethically challenged" in a statement. "Senator McCaskill should be held responsible for willfully lying to the government and the public about the income her and her husband have generated through the leasing of their private plane," Arnold said. "From day one, the ethically challenged McCaskill has purposely misled the government and the people of Missouri about the use and ownership of her plane, which raises very serious questions, including potential conflicts of interest, about why she has been hiding information about her plane." McCaskill's plane use has become a lighting rod for Republican criticism as she faces a tough reelection fight this year against Missouri Attorney General Josh Hawley. FACT's complaint against McCaskill comes after the Washington Free Beacon first reported last week that the senator used her private plane during a recent "RV tour" through Missouri. This entry was posted in Issues and tagged Claire McCaskill, Ethics. Bookmark the permalink.